At least two or three relatively bright stars in M50 can be resolved in binoculars, while small telescopes reveal the cluster’s distinctive heart-shaped figure. 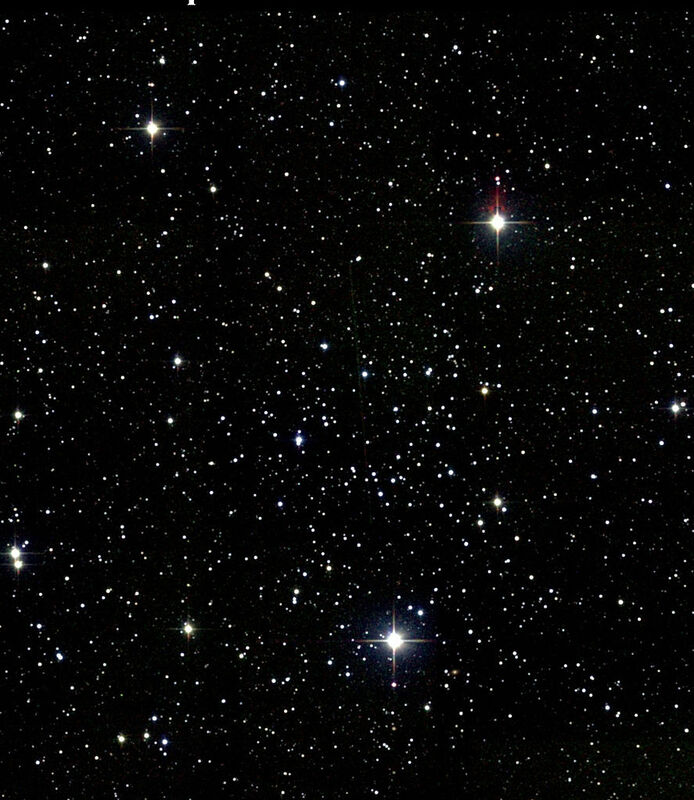 6-inch and 8-inch telescopes show at least 40 of the cluster’s blue-white stars, as well as some yellow and orange stars. 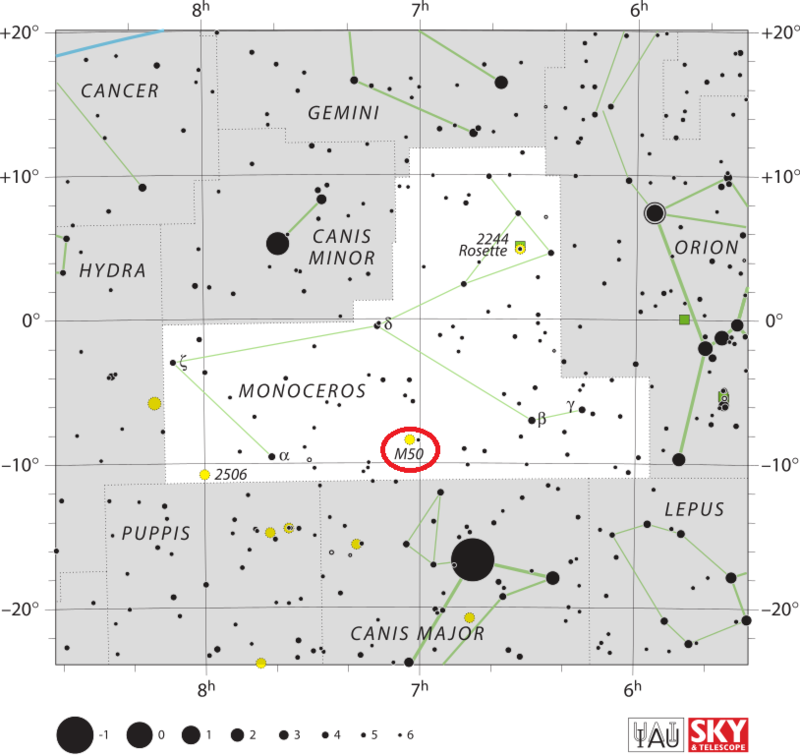 The best time of year to observe M50 is in the months of December, January and February. Messier 50 has an angular diameter of about 15 by 20 arc minutes, corresponding to a spatial diameter of 20 light years. The dense core of the cluster spans only 10 arc minutes or 10 light years. 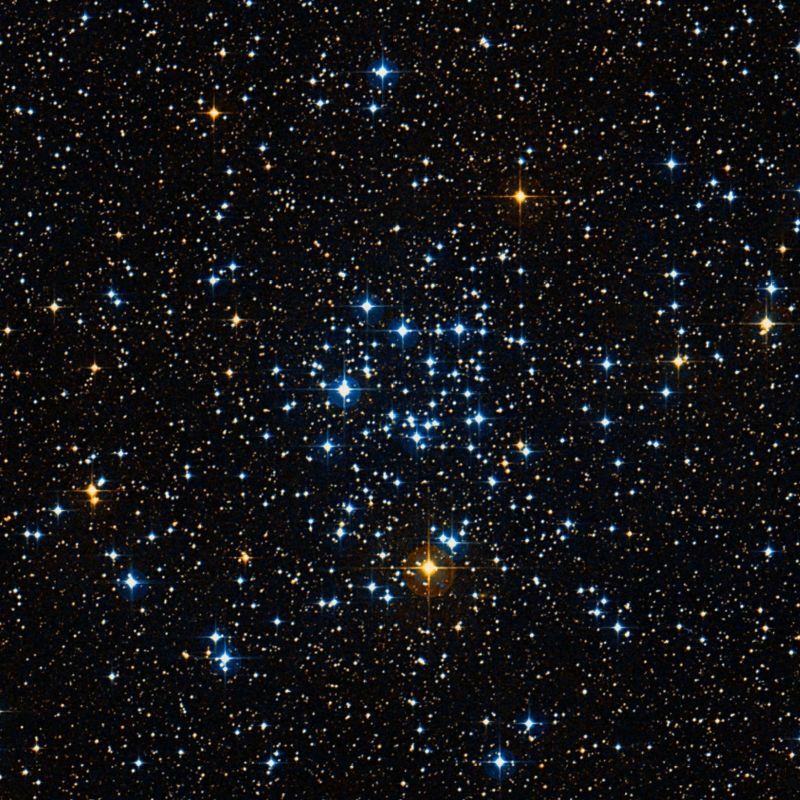 M50 has an estimated age of 78 million years, which makes it a very young cluster. It is composed of many young, hot, luminous blue stars. It also contains several yellow giants and a red M-class giant, which is positioned 7 arc minutes south of the cluster’s centre. Messier 50 was possibly discovered by the Italian astronomer and mathematician Giovanni Domenico Cassini before 1711 based on a report by Jacques Cassini, his son, in his book Elements of Astronomy (1740). Messier 50. Atlas Image mosaic obtained as part of the Two Micron All Sky Survey (2MASS), a joint project of the University of Massachusetts and the Infrared Processing and Analysis Center/California Institute of Technology, funded by the National Aeronautics and Space Administration and the National Science Foundation. 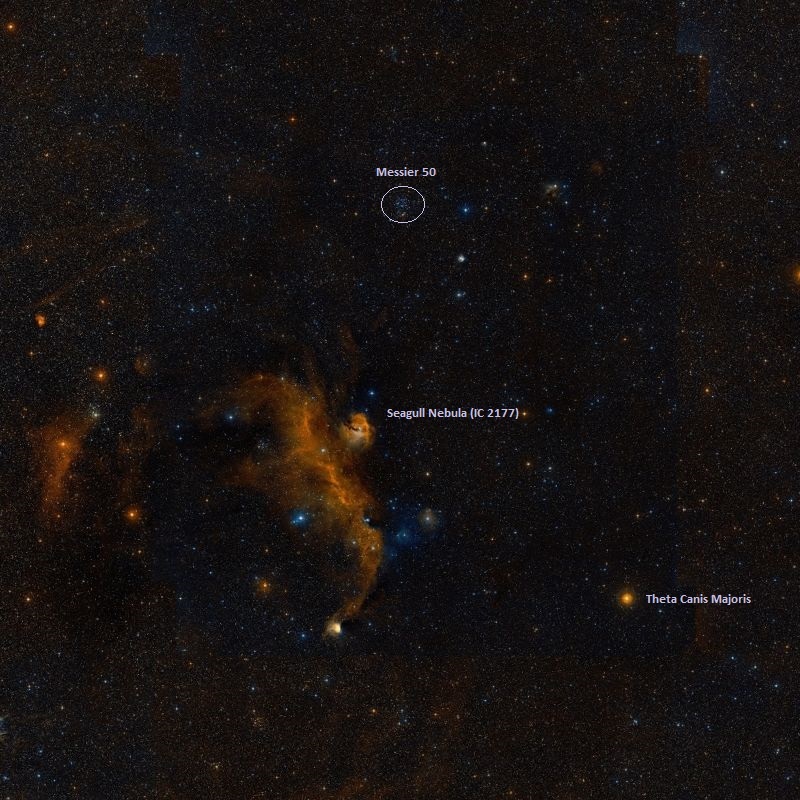 A delicate and close double star in a cluster of the Via Lactea [Milky Way], on the Unicorn‘s right shoulder. A [mag] 8 and B 13, both pale white. This is an irregularly round and very rich mass, occupying with its numerous outliers more than the field, and composed of stars from the 8th to the 16th magnitudes; and there are certain spots of splendour which indicate minute masses beyond the power of my telescope. The most decided points are, a red star towards the southern verge, and a pretty little equilateral triangle of 10th sizers, just below, or north of it. The double star here noted was carefully estimated under a full knowledge of the vertical and parallel lines of the field of view: this was made triple by H. [John Herschel], whose 2357 of the Fifth Series it is; but he must be mistaken in calling it Struve 748, which is Theta Orionis. It is sufficiently conspicuous as a double star, and though I perceive an infinitesimal point exactly on the vertical of A, I cannot ascertain whether it is H.’s C.
This superb object was discovered by Messier in 1771 [actually 1772], and registered “a mass of small stars more or less brilliant.” It is 9deg north-north-east of Sirius, and rather more than one-third of the distance between that star and Procyon. John Ellard Gore, Irish amateur astronomer, author and one of the founders of the British Astronomical Association, studied the photographic plates taken by English astrophotography pioneer Isaac Roberts in 1893 and estimated the stellar population of M50 at about 200 stars in the cluster’s main body.